With the tiny paintings, I will often paint a batch of skies, or water, or whatever, and go back in and decide what to do with it later. 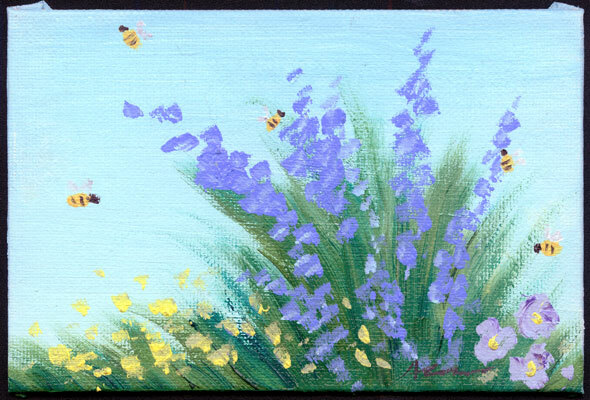 When I pulled out this warm blue sky to work on it again, I wanted to do something impressionistic for spring that really brought that feeling of warm sleepy days with bees buzzing around the flowers. The edges of this canvas board are finished, the image wrapping around to the sides to add a some extra dimension. The easel is included, so this painting can be displayed as is on a bookshelf, desk, windowsill, or anywhere you want a little spring sunshine. 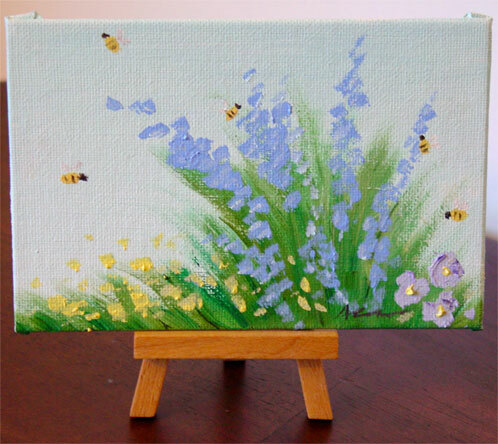 Impressionist Flowers, 6″x4″ oil painting on canvas board with 5″ tall wooden easel, sold.